At 9:20 p.m., the bassist and ex-leader of legendy British group The Police came on stage, ready to reward the audience's enthusiasm with some of his most famous tracks. First, he sang 'If I Ever Lose My Faith in You', from his 'Ten Summoner's Tales' album. Next came 'Every Little Thing She Does is Magic', one of his hits with The Police. But it was with 'English Man in New York' that the British star truly lit a fire in those present, many of whom had come hours earlier to await the performance. 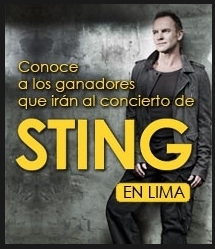 This song featured a clarinet from Peru's national symphony orchestra, which played with Sting last night, directed by one of the musicians accompanying him on his tour. The participation of the Peruvian musicians was outstanding. The concert - which also included hits like 'Roxanne' and 'Shape of my Heart' - was rich with the sound that the singer has been exploring with his latest disc, 'Symphonicities', infused with classical influences. Along with the orchestra appeared Dominic Miller, a guitarist who has recorded seven albums and who got his start playing with Phil Collins, but is more famous for his association with Sting. In fact, Miller, who was born in Argentina, is a co-author of 'Shape of my Heart'. Sting himself also showed off his guitar-playing abilities during many tracks. Another special moment was a tango dance performed by a pair of dancers during the first part of the concert. The show closed with a rendition of 'Message in a Bottle', leaving the audience more than satisfied. Live Nation is pleased to announce that Sting - accompanied by a symphony orchestra and band - will extend his celebrated Symphonicity world tour with additional dates across Europe this summer. Following sold-out performances throughout North America, Europe and Australia, the Symphonicity tour will appear at the See Rock Festival in Graz on June 11, 2011. Live Nation is pleased to announce that Sting - accompanied by a symphony orchestra and band - will extend his celebrated Symphonicity world tour with additional dates across Europe this summer. Following sold-out performances throughout North America, Europe and Australia, the Symphonicity tour will appear in Bucharest on June 6, 2011, Sofia on June 7, 2011, Belgrade on June 8, 2011, Ljubljana on June 10, 2011, and Budapest on June 30, 2011.